SANTA CLARA, CA and BARCELONA, SPAIN--(Marketwire - Feb 21, 2013) - @ Mobile World Congress -- Magellan, a leader in GPS devices for vehicles, fitness, outdoor and mobile navigation, today announced Magellan® SmartGPS Apps for iOS and Android mobile devices. Following the recent announcement of Magellan's award-winning SmartGPS device, the free Magellan SmartGPS Apps for iOS and Android devices are the next key elements in Magellan's Smart Ecosystem, a cloud platform that integrates social media and navigation content directly onto a navigation map. The SmartGPS Apps automatically deliver continually updating reviews and tips for local businesses from social media including Yelp, Foursquare, and other partners to create current, local and personalized driving and pedestrian experiences. The Magellan SmartGPS mobile apps display location-relevant information "squares" that graphically flip to show reviews, tips and offers from Yelp and Foursquare for nearby restaurants, stores and services. Users can then navigate to those locations directly from the SmartGPS App without needing to open an additional application or device. The cloud architecture enables new monetization of end users' mobile search and navigation, and additional social media and content partners. "We architected the Smart Ecosystem to integrate with automotive infotainment and mobile network service platforms so users can enjoy a truly mobile, connected car experience now," said Peggy Fong, President of MiTAC Digital Corporation. "SmartGPS mobile apps connect to the vehicle dash, allowing users to easily search social media and points-of-interest for destinations, and send the locations via Bluetooth or Wi-Fi to SmartGPS enabled vehicle navigation systems." 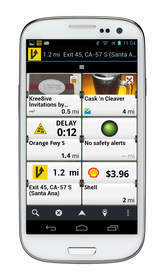 Magellan's free iOS and Android SmartGPS apps create a total-solution SmartGPS experience that is truly mobile. Magellan connects the smartphone to the vehicle dashboard, enabling location sync and sharing, hands-free operation and data connectivity. 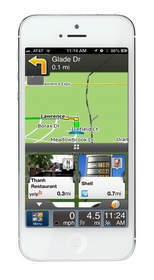 Users can pair their Magellan SmartGPS app with SmartGPS-enabled navigation systems. Using their SmartGPS App, SmartGPS enabled navigation system, or PC, users can search for a location, save the location in Magellan's Smart Ecosystem cloud, and sync and share the location to any SmartGPS enabled device via Wi-Fi or Bluetooth. The free Magellan SmartGPS Apps will be available in North America this Spring, and in Europe this Summer, from the Apps Store and Google Play. Premium versions of both apps featuring spoken turn-by-turn navigation will also be available. Headquartered in Santa Clara, CA, MiTAC Digital Corporation, manufacturer of the Magellan (www.magellangps.com) brand of portable GPS navigation consumer electronics devices, is a wholly-owned subsidiary of MiTAC International Corporation. Recognized as an industry pioneer, Magellan globally markets its award-winning portable navigation devices including the Magellan® RoadMate® series for autos, RVs, fleet and commercial vehicles, the eXplorist® PRO for mobile GIS applications and field data collection, the eXplorist outdoor series for hunting, fishing, hiking, marine and geocaching enthusiasts, Magellan Fitness Switch™ series of crossover GPS watches, and mobile apps and accessories for smartphones. Follow Magellan on Facebook, Twitter and YouTube. Magellan's free SmartGPS Apps for iOS mobile devices automatically deliver continually updating reviews and tips for local businesses from social media including Yelp, Foursquare, and other partners to create current, local and personalized driving and pedestrian experiences. Magellan's free SmartGPS App for Android mobile devices allow users to easily search social media and points-of-interest for destinations, and send the locations via Bluetooth or Wi-Fi to SmartGPS enabled vehicle navigation systems.